Naturally, growing the game is a nationwide mission for USA Hockey, and California has always been at the forefront in helping champion the cause. Look no further than the healthy 11 facilities and partner associations that participated in this month’s Try Hockey For Free Day – an initiative designed to provide a national platform for introducing children to the sport, free of charge. Those participating rinks included: Desert Ice Castle (Cathedral City), Gateway Ice Center (Fresno), Iceoplex Simi Valley, Icetown Carlsbad and Riverside, Oakland Ice Center, Oak Park Ice Arena (Stockton), Sharks Ice-San Jose, San Diego Ice Arena, Snoopy’s Home Ice (Santa Rosa) and The Rinks-Westminster Ice. 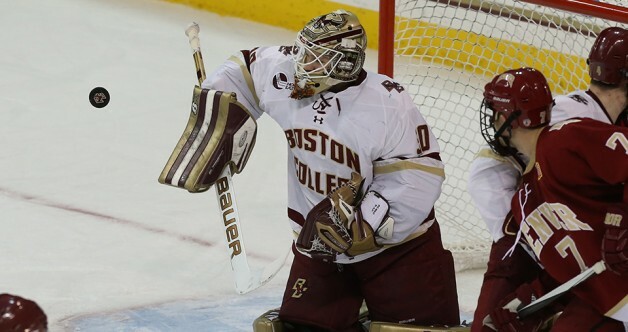 In Hockey East, junior Thatcher Demko, a former San Diego Jr. Gull and Los Angeles Jr. King, was named the Goaltender of the Month for October after the San Diego native and Vancouver Canucks draft pick posted a 5-1-0 record to compliment a 1.00 goals-against average for Boston College, while University of Massachusetts sophomore Dennis Kravchenko, a former LA Select from Laguna Niguel, was tabbed Player of the Month after racking up seven goals for 12 points in six games. Meanwhile, in the women’s ranks, Garden Grove’s Celine Whitlinger, a former Anaheim Lady Duck, was named the CHA Goaltender of the Month after the senior forged a 2-3-1 record to compliment a 1.65 goals-against average and a .940 save percentage for Penn State University. Kudos, too, to former San Jose Jr. Shark and Gilroy native Niko Della Maggorie, who was named the North American Hockey League Goaltender of the Month for October after posting a 4-0-1 record to compliment a 1.17 goals-against average and a .962 save percentage as a member of the Springfield Jr. Blues. Another former Jr. Shark, Casey Wellman, was a part of the U.S. Men’s Select Team that competed in this year’s Deutschland Cup, which was played earlier this month in Germany. Wellman, a forward from Brentwood, is skating this season for Spartak Moscow of the Kontinental Hockey League. Craig Johnson, the Anaheim Jr. Ducks director of coaches and their Bantam AAA1 head coach, served as an assistant coach for the U.S. team. The U.S. team finished in second place with a 1-1-0-1 record. Three other players with California youth hockey ties – forwards Patrick Khodorenko, Joey Cassetti and Sasha Chmelevski – also represented the U.S. in international competition this month. Khodorenko, a Walnut Creek native who played for a handful of California programs and is skating this season with the U.S. National Under-18 Team, competed in the Under-18 Five Nations Tournament, which was showcased in Switzerland. Cassetti, a former Jr. Shark from Pleasanton, and Chmelevski, who played locally for the Anaheim Wildcats, skated for U.S. National Under-17 Team at the World Under-17 Challenge, which was held in British Columbia. Cassetti, a Boston College recruit, is playing this season for the U.S. National Under-17 Team, while Chmelevski is skating with the Sarnia Sting of the Ontario Hockey League. The U.S. won the Five Nations with a 4-0 record; it went 3-0-1-1 at the World Challenge (sixth-place finish). Great seeing the Jr. Kings and Uncle Kory Foundation (UKF) team up in an effort to raise awareness and much-needed funds to support brain cancer research. The collaboration will encourage Jr. Kings players and their families to help champion the cause through engaging in philanthropic endeavors with UKF, on and off the ice. For more information on the UKF or to make a donation, visit UncleKory.org.